We are pleased to announce that Maria Muscarella will be the featured instructor for the Spinnery’s 2019 Fall Knitters’ Weekend Retreat. 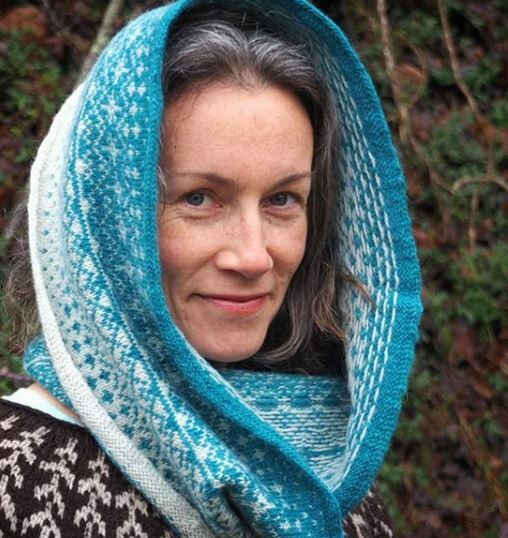 Maria Muscarella is the dyer, teacher, podcaster, and knitwear designer behind Ninja Chickens. She began her career in the field of holistic medicine as a nurse-herbalist creating remedies, teaching herbal medicine, and running an herbal clinic & apothecary. Maria picked up knitting as a hobby in the early years of her profession and her love of all things woolly steered her down the career path to fiber arts. Her making is naturally influenced by her love of the gardens and woods that surround her home, and her passion for herbal medicine led her to natural dyes and eco printing. She spends her days working with fiber and herbs in a hand-built, 16-sided house. Saturday morning, Maria will walk us through fabric preparation, printing on plant vs animal fibers, making a simple natural dye bath for silk shibori, and we’ll get started with eco printing on sock blanks (shown below) using the steaming method. After lunch, we will start by unwrapping our prints from the morning (always the favorite part of class). Then, our hands will be busy learning the blanket method of eco printing, along with modifying our prints in an iron simmer bath. The workshop will be held in Putney, Vermont from Friday, September 27th to Sunday, September 29th, 2019. It will begin with dinner on Friday evening and conclude by noon on Sunday. The Spinnery’s weekends feature great food, lively companionship and lots of yarny goodness. Your registration fee of $375 per person includes three meals (Friday dinner, Saturday lunch and dinner) and nine hours of instruction. Registration Forms with housing suggestions can be found on the Spinnery website, here.